When it comes to recreational bones and chews for dogs, antlers seem to be a blessing for some dogs, and a curse for others. The upside to antlers is that most dogs seem to love them, they’re long-lasting and they help keep teeth clean. However, an increasing number of veterinarians are discouraging dog guardians from offering very hard chews, including antlers, due to the potential for broken teeth. In the U.K., veterinarians have seen a steady increase in fractured carnassial teeth. And while broken teeth are common in dogs, fractures in back teeth are not. The veterinary dentist I work with is fond of saying he has been able to fund an entire wing of his dental clinic thanks to dog owners offering antler bones to aggressive chewers! When your dog breaks a tooth, the pulp — which is the sensitive nerve inside — can be exposed. Not only is an exposed nerve extremely painful, it can also lead to a deep infection and root abscess. Most pets with tooth fractures don’t show obvious signs of pain, but sadly, many suffer silently for weeks, months or even years before the situation progresses to the point where they can’t eat comfortably and lose their appetite. The longer a broken tooth goes untreated, the worse it gets. Oral bacteria can invade and infect the tooth pulp and cause it to die. Next, the infection often moves from the root tip to the bone, destroying it. In severe cases, the infection moves past the bone into the skin, forming a facial fistula (a whole in the face through which the infection drains). Fortunately, not all broken teeth are so serious. If only the enamel has been fractured, the tooth can often be smoothed to remove sharp edges. However, if x-rays indicate the tooth is dead, if pulp is visible or if the tooth has turned from white to pink, purple, grey or black, treatment typically involves either extraction or root canal therapy. It’s important for every dog parent to understand that a fractured tooth requires prompt veterinary care. I spend a lot of time with dog parents going over detailed recommendations for appropriate recreational bones. Some of my clients think I’m overplaying the importance of choosing the right type of bone for their dog, but part of the reason I'm so detailed and thorough is to avoid fractures and other chew bone-related catastrophes. There are some dogs for which no bone or chew is appropriate because they are just too aggressive, or they've already broken too many teeth. The veterinary dentist I work with, Dr. Stephen Juriga, sees hundreds of cases of fractured teeth as a result of inappropriate raw bones, and not just from my practice. He notes that antlers are often a problem, as are Nylabones. Anything you can't put a dent in with your fingernail has the potential to fracture the crown of your dog’s tooth. It's very important to pair the personality, breed, age and tooth condition of the dog with the right type of chew. 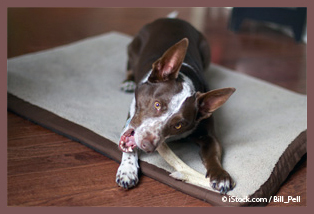 One size does not fit all when it comes to recreational chews and bones. The first thing to ask yourself: “Is my dog an aggressive chewer?” This type of chewer is more interested in eating the bone than leisurely gnawing on it. She wants to consume the chew in its entirety, and the sooner, the better. Many aggressive chewers fracture their teeth. They acquire multiple slab fractures in their eagerness to break the bone down as quickly as possible. These dogs get hold of a bone and chew like mad, fracturing or wearing down their teeth very quickly. If this describes your dog, needless to say, she shouldn't be given hard bones like antlers or marrowbones smaller than the size of her head. I also advise against thin or narrow bones that fit nicely into her mouth, allowing her to apply a strong vertical bite force. My pack includes pit bulls who are very powerful chewers. They’re not into swallowing their bones, but they're very passionate chewers. Offering them small, narrow femur rings or antlers would be a really bad idea, because the vertical bite force as they chomped down on an antler could easily break teeth. What I offer my pitties are big, raw knucklebones. Raw knucklebones are much softer than rock hard antlers and are gentler on the teeth. I also monitor their chewing very closely, because they can whittle a large bone down to the size of a ping-pong ball in about an hour. Once a bone is that small, it's too small to be safe, so I watch my dogs closely and when they've worked a bone down significantly, I take it away. Are Antlers Appropriate for Any Dog? If your dog happens to be a soft chewer who just enjoys holding or gently gnawing on a bone, antlers may be a good choice. You can purchase elk, moose or deer antlers, and they're very economical because they last forever. Antlers come in a variety of sizes and can be split, cut or whole, but again, you don't want to give a small antler to a large dog because of the potential for tooth fracture. Giving small antlers to small dogs and big antlers to big dogs is fine, but first you want to make sure they're gentle chewers.